By Scott Gilfoid: WBA heavyweight champion David Haye (25-1, 23 KO’s) reportedly is sparring with 6’7″ 2008 Olympic bronze medalist Deontay Wilder (16-0, 16 KO’s) in trying to get ready for Haye’s July 2nd fight against 6’6″ IBF/WBO heavyweight champion Wladimir Klitschko (55-3, 49 KO’s) at the Imtech Arena in Hamburg, Germany. 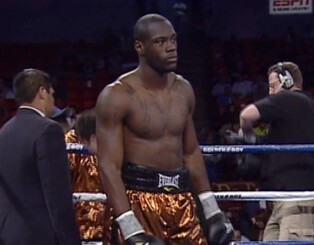 Wilder, a 25-year-old knockout artist, has one of the best right hands in the division and is someone that could be a future heavyweight champion if his handlers are able to teach him how to jab and use his left hand. Wilder has one of the best right hands in the sport and could hurt Haye. Right now, Wilder is a work in progress. But his right hand is lethal and I can see him giving Haye some good sparring with his weapon alone. Wilder probably has more power in his right hand than Wladimir, but he’s nothing like him at all in terms of fighting style. Even the way that Wilder throws his right hands is completely different from Wladimir. Wilder tends to loop his rights, while Wladimir throws straight right hands. I can’t see how this will help Haye unless they can have the awkward Wilder learn to mimic Wladimir’s style. Given that Wilder is struggling to just learn how to throw a jab and use his left hand properly, I can’t see him being able to do a halfway decent job copying Wladimir’s style. It might not be such a good idea for Haye to be sparring with Wilder, because Haye could get hurt. Wilder punches with so much power with his right hand, I can see him hurting Haye in every sparring session unless they instruct Wilder to throw with only half power and pad Haye with body armor and extra head gear. Wilder could end up giving Haye multiple concussions if they use this big guy for any length of time. If Haye was running for his life against the soft-hitting 7-foot Nikolay Valuev, just imagine what he would be doing against a slugger like Wilder. God, I would love to see their sparring sessions. It’s probably like a track meet with Haye running from the word go. Wilder is now Audley Harrison. He’s not going to just stand there and let Haye throw punches. Wilder will be all over Haye looking to take his head off with every shot. I can’t see Haye’s team keeping Wilder in the camp for very long because there is too much of a chance of Haye suffering a serious concussion. Wilder is a super heavyweight, not a pumped up cruiserweight with limited height and reach.